Space category (Tib. ཀློང་སྡེ་, Longdé; Wyl. 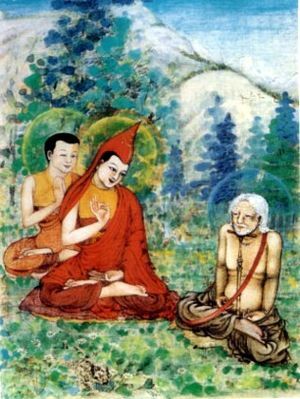 klong sde) — one of the three categories into which Mañjushrimitra divided the Dzogchen teachings he received from Garab Dorje. The root tantra of Longdé is the Longchen Rabjam Gyalpo tantra. The inner category of space, the Longdé, is reckoned to consist of 20,000 ‘volumes’. These can be classified into three: white space (Wyl. klong dkar po), black space (Wyl. klong nag po), and variegated space (Wyl. klong khra bo), or they can also be categorized as nine spaces (Wyl. klong dgu). From Shri Singha, Vairotsana received the Longdé pith instructions, and composed ‘the Vajra Bridge’, a scriptural text, which he transmitted in Tibet to Pang Sangyé Gönpo. Pang Sangyé Gönpo and the six successive disciples in his lineage left this world by dissolving into a body of light. ↑ This is a further subdivision of the white, black and variegated spaces; each being subdivided into three categories. Note that these nine spaces are different from those defined in Jikmé Lingpa's Yönten Dzö, which are more a condensation of the teachings contained in the three categories of Dzogpachenpo. This page was last edited on 9 April 2018, at 23:29.